Home» AP GO's | AP LATEST UPDATES | AP TS LATEST JOB's » AP G.O No:28, Dr. NTRVS Recruitment of VaidyaMitras and other staff - Qualifications for field staff other modalities. AP G.O No:28, Dr. NTRVS Recruitment of VaidyaMitras and other staff - Qualifications for field staff other modalities. AP G.O No:28, Dr. NTRVS – Recruitment of VaidyaMitras and other staff Dr.NTR Vaidyaseva - Qualifications for field staff other modalities. Andhra Pradesh A.P Health, Medical and Family Welfare - Dr. NTRVS -Recruitment of VaidyaMitras and other staff Dr.NTR Vaidyaseva - Qualifications for field staff other modalities framed - Orders – Issued. 1. G.O.Rt.No.4271 Fin. (SMPC) Dept., dt.01-11-2008. 2. From the CEO, Dr.NTRVS Lr.Rc.No.03-DR.NTRVS/F-25-2015, dt:30.09.2015. 1.Review was taken up by the Government on the ongoing NTR VaidyaSeva Scheme. During the review, it is noticed that several formal and informal requests are being received to modify the qualifications for filling up of the field staff of the NTR VaidyaSeva. The main object of the scheme is to provide Medical facilities to the BPL families. Due to non availability of fully trained (lack of domain knowledge) and qualified VaidyaMitras and other staff of the NTR VaidyaSeva, the BPL families who are approaching the notified hospitals of NTR VaidyaSeva are not getting full information and assistance on the procedures under NTR VaidyaSeva. 2. 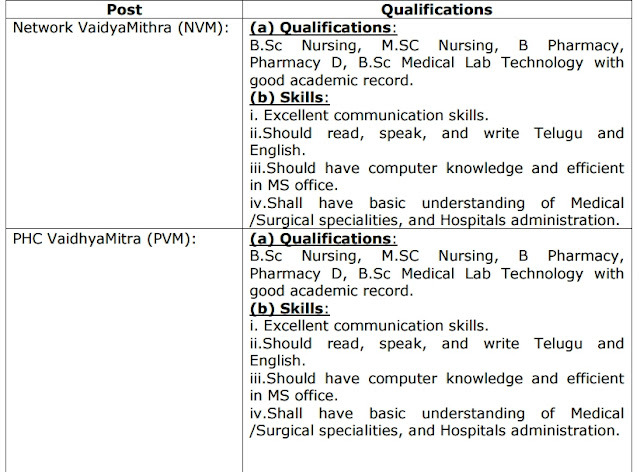 The Chief Executive Officer, Dr.NTR Vaidya Seva in his letter 3rd read above has furnished the qualifications of the field staff of the NTR VaidyaSeva. 3. Government after careful examination hereby frame the following Qualifications and Skills for Field Staff who shall be recruited through the Outsourcing Agencies, subject to guidelines issued in the G.O. 1st read above for effective implementation of the scheme. District Managers and District Coordinators are almost similar. Hence, the Government is hereby discontinuing the post of (13) District Managers with immediate effect as the same can be carried out by the District Co-ordinators with better planning and use of IT. The post of existing Divisional Team leaders is also hereby merged with the network team leaders for effective implementation of the scheme as team leaders. The PHC VaidhyaMitras and Network Hospitals VaidhyaMitras are merged as VaidhyaMitras. identify the number of posts and communicate the same to the respective District Collectors along with pay particulars to enable and notify the same. 6. The Chief Executive Officer, Dr.NTR VaidyaSeva/all District Collectors are hereby requested to follow the following guidelines. Department, dated 01-11-2008 should be followed strictly. b. The Government hereby accord permission to the District Collectors to select the Outsourcing agency through the following committee duly following the instructions and existing procedure. 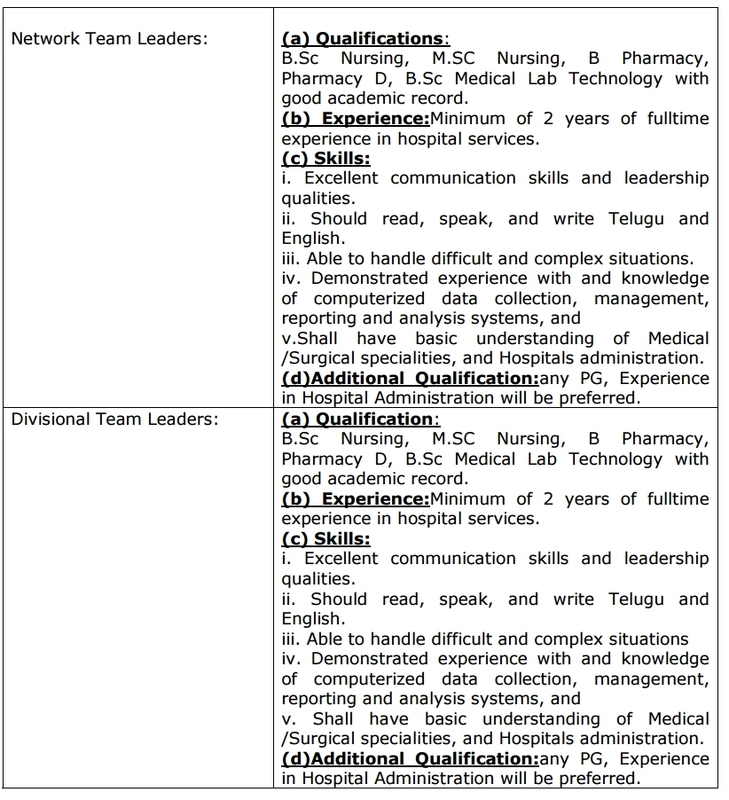 c. The allocations of marks for the selection of the field staff is as follows. d. All the candidates should possess the certificates from the Recognized universities by the UGC. 7. The Chief Executive Officer, Dr.NTR VaidyaSeva Trust and All District Collectors shall take necessary action accordingly.